The EU Water Framework Directive, which came into force in December 2000, aims to help ensure that water is more effectively and sustainably managed for the benefit of both society and the environment. It brings together management and protection of the whole of the water environment – surface and groundwater – and the activities and processes that impact it. For groundwater, the WFD places a number of obligations on Member States (MS). The primary requirement is that groundwater is protected at least to the same level as that required by the existing Groundwater Directive (80/68/ECC). Beyond this MS must strive to ensure that all groundwater bodies are of good status – in terms of water quality, this is based on thresholds for the chemical constituents of groundwater and their impact on ecosystems. 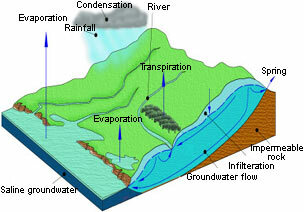 Clearly this is most relevant to surface water ecosystems and so highlights groundwater’s important place in the hydrological cycle. The route to achieving good status is mapped out in the WFD. It requires an initial characterisation, implementation of monitoring and a programme of measures to reach or maintain good status which considers both groundwater resources (groundwater quantitative status) and groundwater quality (groundwater chemical status). With the UK’s high population density, intensive agriculture and a legacy of heavy industry, many of our groundwater bodies have been classified as poor status. These poor status groundwater bodies will need to have measures, that are proportionately costly to the benefits, put in place in order to achieve and retain good status. Because of the high degree of complexity in addressing groundwater, the WFD provided for the production of a new groundwater directive which provides details of criteria for assessing good groundwater chemical status and the identification of starting points for trend reversal. The Directive also outlines controls on indirect discharges to groundwater that would otherwise be lost when the existing Groundwater Directive is repealed. It is very significant that diffuse pollution, which is excluded from regulatory control in the current Groundwater Directive (80/68/ECC), is included in the WFD. The implications of these controls to the UK, particularly in relation to nitrate and pesticide concentrations in groundwater, are very important. Nitrate pollution of the unsaturated zone in the Chalk and Permo-Triassic sandstone aquifers, often related to historic and current agricultural activities is widespread and a store of decades of high level nitrate loadings is held in this zone. Increasing trends in nitrate concentrations are widespread in groundwater sources. Some of these sources now pump groundwater which must be blended with low nitrate waters from other groundwater sources or be treated before used for public supply. The challenges of reversing these trends and achieving good groundwater status will be significant. However we must not forget the need to implement measures that are both ‘technically feasible and not disproportionately costly’. The Water Framework Directive is generally welcome as a means to better manage the water environment, however, as is indicated here, the implications of meeting its requirements are wide ranging for the UK. The capacity of those responsible will be severely challenged, both in terms of financial and human resources. It is appreciated that the potential implications of the WFD have yet to be fully appreciated by the general public.